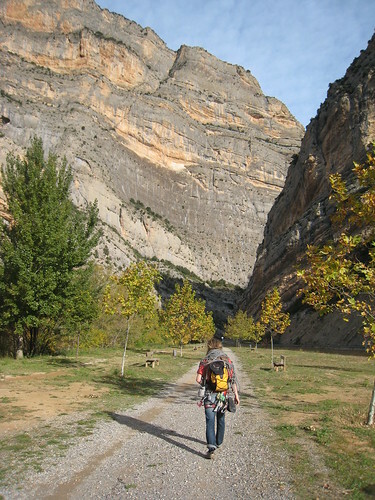 Last week my friend Joakim and I had a fun day up on the impressing wall Paret de les Bagasses in Terradets. We wanted to a route all the way to the top so we choose Mescalina, 450 meters and 16 pitches. I would say that the route is perfectly bolted and really is a clip up. We brought 15 quickdraws, maybe 5 of those 60 cm long. We climbed with double rope but I recommend you do the rope with one 70 meter rope (two rapells instead of one on the descent). I found the route and the grading quite stiff and ended up pulling on quickdraws now and then. The sun if really strong on the wall so bring plenty of water and start early in the morning to enjoy as much shade as possible, this is a winter destination. Also avoid doing the route on weekends since this is a very popular wall. Oh, forgot to say that it takes about 7 minutes to walk from the car to the start of the climb. Click the photo to see where the route goes. A topo, in Catalan, can be found here. Here is a video from the top (where I speak Swedish).